For decades, we’ve been looking forward to completely digital paper-free offices. Unfortunately, it appears that this dream will never come true. We’ve got the technology to go paperless, but offices and homes are still chock full of papers. So maybe the answer is to use current tech to make paper filing simpler. That’s the aim of iMicroData, the company that developed the iMD Smart Filing System. 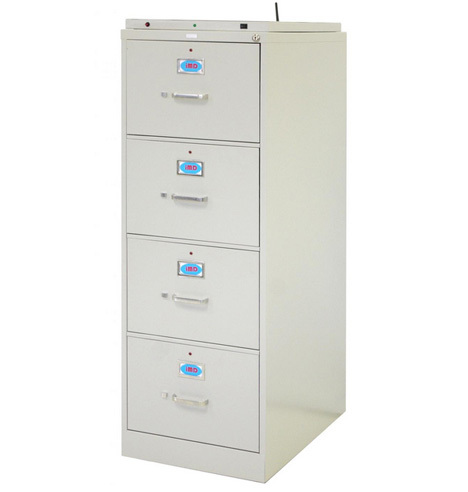 The system smoothly integrates digital technology with analog filing methods to create a wired filing cabinet with folders that show you where they are. The system requires you to index all of your existing files into an app. 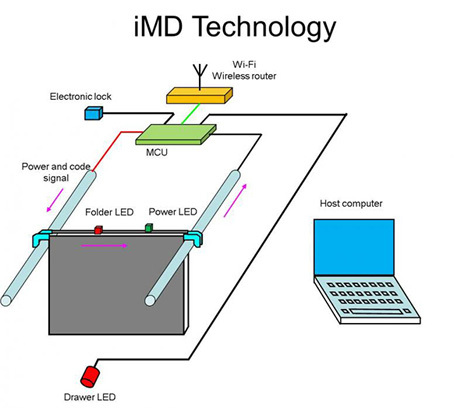 Then, using wi-fi and RFID tags, it tracks which drawer the folder goes into. When you need to locate a file, you go to the app and search for the identifying information, including keywords or tags. The app tells you which drawer the folder is in, unlocks that drawer and causes the LED on the outside to blink. 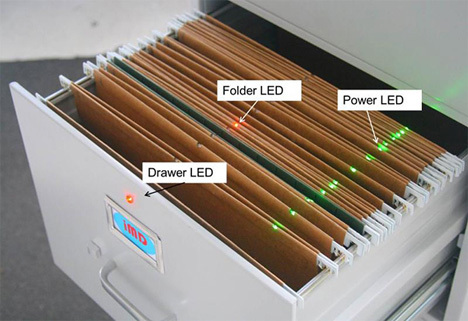 When you open the drawer, an LED glows on the folder you want to lead you right to it. If you need to move the folder to a different location, you put it there and press the “re-file” button on the outside of the drawer; the system learns the new location. Conductive rails in the drawers keep the folder LEDs powered; each folder has a light that lets you know it’s receiving power. The system can even track down missing or checked out files, a feature which makes the whole setup priceless for companies with notorious file losers. All in all, the iMD Smart Filing System can track up to four billion folders, which is the equivalent of 40 million file cabinets. The “master” cabinet will cost $2000 and each additional cabinet will cost $1500, which sounds totally worth it for the office arguments this system could prevent and the added level of security that comes from not having to label folders or drawers.